Highlights include: Sports Review, lost property, Easter raffle, sports news, and much more. At the junior school, we have displayed our values, our mission, our attitude to learning for all to see. Check it our next time you’re visiting. Welcome to the best school in New Plymouth! 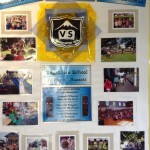 Vogeltown Primary School in the heart of New Plymouth, is a warm, innovative and progressive school mixing the very best of the future, with proven values and attitudes of the past. At the centre of our school are the people - students, parents, and staff; all working together to ensure that every child gets the best possible learning opportunities.